If you live in a region that gets snow, spring is potentially the messiest time of year in the butterfly garden. Most perennials you plant in spring won’t yield nectar-filled blooms until next season. By planting just a few months earlier, you’ll see some plants in full glory a year sooner! If your plants weren’t happy in their spot this season, what have you got to lose by attempting to move them? That’s right…unhappy plants! When planting or transplanting assess your soil and amend with compost if necessary. Don’t give your plants a chance to survive…give them an opportunity to thrive! The later you plant into fall, the more important it is you mulch to protect the plant roots over winter. What fall planting ideas could have you reaping butterfly rewards as soon as next season? Milkweed is the lifeblood of Monarch Butterflies and not having enough will keep garden visits at a minimum and cut your raising adventures short. Autumn is also prime time for transplanting unhappy native milkweed varieties. The cool temperatures of fall put less stain on transplants. As long as you dig up most of the root system and keep them sufficiently watered, milkweed transplants can be successful. Swamp milkweed (Asclepias incarnata) is easier to transplant without a rhizomatous root system. While milkweed continues the monarch circle of life, nectar flowers give the adults the energy to continue that strenuous cycle. One Year Less of Waiting! Yellow clusters of flowers are a late season treat for many pollinators and a reliable support system for migrating monarchs. Last fall I added 4 plants, and this season we had four flowering stalks from those plants. If we would have planted this spring, not one purple flower would have bloomed. Fall is also a good time for dividing, which in turn will multiply your plants! Fall division gives the liatris roots time to get acclimated before ground freeze. 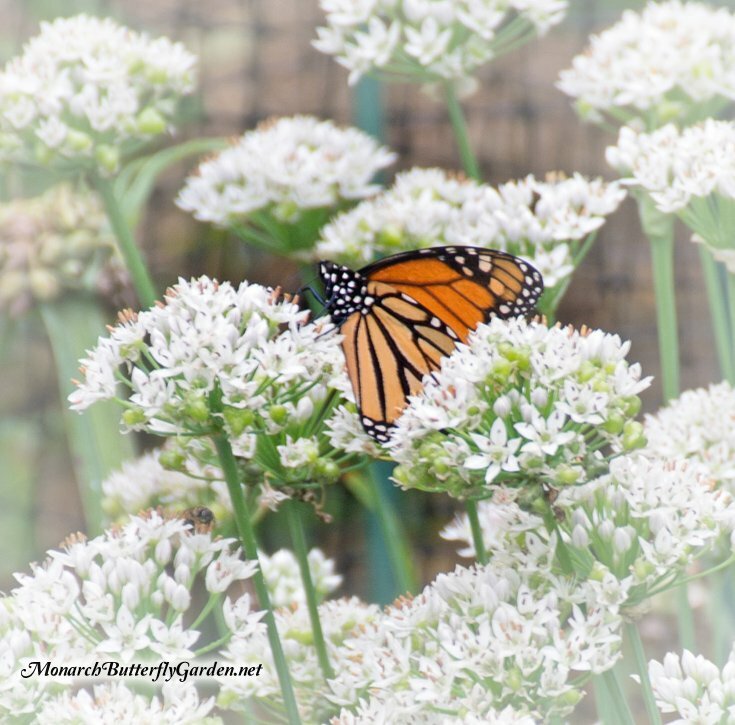 One of the best perennials for late-season monarchs. We already have the ‘gateway’ variety (Eutrochium maculatum), and this fall we are adding ‘sweet Joe Pye’ (Eutrochium purpureum) to the mix. Try a eutrochium species native to your region. a. Garlic Chives (Allium tuberosum) have showy white flowers that are a great nectar source for late season bees and migrating monarchs. I was so excited to see the only viceroy of the season recently with wings spread wide in a complementary vision of beauty. When I returned the viceroy had been secretly replaced by a monarch…still a lovely vision! Chives provide nectar to spring monarchs returning from Mexico and have beautiful purple blooms. 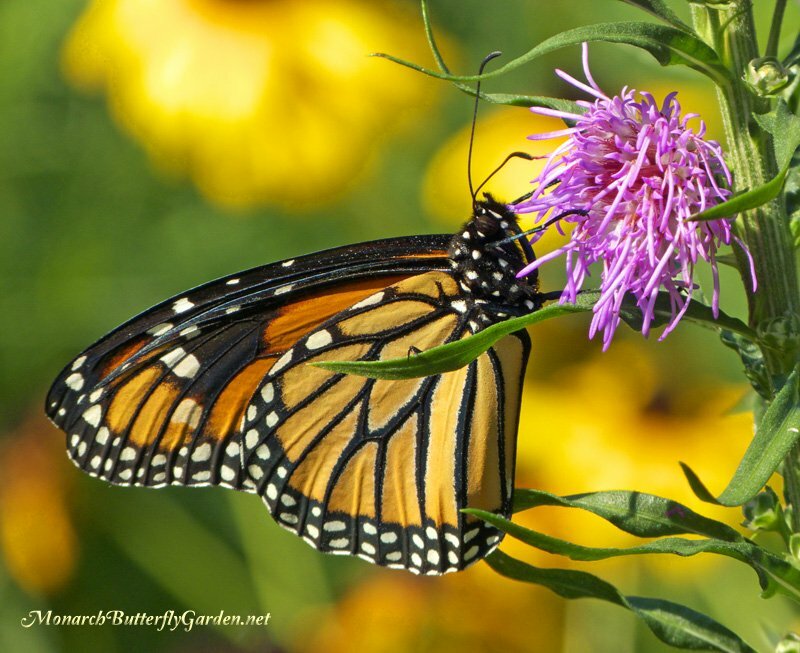 In the northern plains, these are usually finished blooming by the time we see monarchs but they are a great nectar source for early arriving pollinators. Spectacularly showy pink and purple blooms are a big hit with summer pollinators. As for butterflies, this was one of the tiger swallowtail’s favorite treats. We divided ours last fall, and doubled our plants this season! These are just some ideas to get you started. Check out our butterfly plants page for other winter hardy perennials and also talk to local gardeners to see what’s working for them. Starting (or rearranging) your garden now, can pay off big next butterfly season. We happen to have a lot of milkweed on our little farm here in the mountains of Virginia, even though I still haven’t found eggs or caterpillars. There have been lots of monarchs and other butterflies loving my little patch of zinnias. Next year we are planning on planting part of our field all zinnias. So excited! I found 10-15 large healthy monarch caterpillars in late Dec. They are on badly frozen back milkweed plants. Can I get them to chrysalis and if so where can I take them to emerge? We are located about 50 miles north of Houston and it is about to get very cold. I really want to rescue/move them if at all possible. Can you advise? Can milkweed canes be pruned after the caterpillars have stripped the plant of its leaves? My milkweed is in a rose garden, and they are appearing unsitely. yes, you can cut them back after the leaves have been devoured. If they are perennial to your region, they will grow back. Hi Tony, I want to plant a lot of Mexican sunflower seeds this fall, but I’ve read directions on how to do it. Some say to cover the seeds with a little soil, and others say not to cover them at all because they need the sun to germinate. So which way is correct, and is now too early. I’m in Western MA Thank you!!! Tony, I’m so glad you included garlic chives in this list. I don’t think there is any plant in our garden that attracts a wider variety of pollinators and butterflies. About 25 years ago we bought a small pot of garlic chives to plant for use in cooking. Today we have countless hundreds of plants all over our property. In a flower bed, garlic chives spread rapidly and can crowd out other plants. Not sure how the large black seeds are naturally spread distances, because I’ve not seen birds pay attention to them, and I think the seeds are too heavy to be wind-carried. The flowers are certainly beautiful in late summer, as are the dried seed heads. When we finally cut the dried-out flower stalks we spread the seeds in remote parts of our property. They germinate so easily and will grow anywhere, in sun or shade. hi!! I have one question about 2 plants. this is my first year to grow mexican sunflower and milkweed ..
What the best way to know they will come back ? do i just let them self sow or should I gather the seeds save them til spring and them plant ? tropical milkweed germination rate will be low outdoors and we’ve never had Mexican sunflower seedlings come up, as cold winter temps will kill most of the seeds. I would gather seeds for both this fall. I wanted to transplant my single purple milkweed plant I luckily found at a local native nursery. I originally planted it in June as a small seedling. At the beginning of September, I realized I planted it in a not so ideal location. So as I was carefully digging it up, I did not realize how huge the Taproot was on a plant that was only a foot tall or so. I accidentally broke off a good size piece of the root. I moved the plant into it’s new home, up front in the bed to get more sun. I took the piece of root that broke off and put it in a pot to see if I could get another plant to grow, seeing how this species is hard to find. Well today I noticed a tip poking out of the pot! I will probably over winter it in the pot and plant it out in spring. And it appears the original plant took to the transplant because it’s still green and upright three weeks later! congratulations Matt…not sure where you’re located, but here in Minnesota, I would direct plant within the next couple weeks. I have 7 catapillers now, in two separate carriers. I clean the cages and feed fresh milkweed twice a day. How long will it take before they go to chrysalis? How soon do I release them when they emerge? I am hoping for the best and feel like an expectant dad! I am new to Florida as well. Is this late to still be getting eggs hatching? Thank you. The website has been a life saver for someone new to all this. My first attempt at raising monarchs back in July/early august yielded me 16 caterpillars which only 6 were successful to form chrysalis… I now have 18 monarch caterpillars hatched with 2 eggs still pending..I have a total of10 milkweed plants. Ranging from 3 feet tall to 2 1/2 feet tall.. I’m hoping these are suffice to raise these monarchs to 5th instar and Chrysalis form..will post an update next week! I would like to plant something on our school property that would be beneficial to and attach Monarchs. I asked permission of our school’s head custodian to plant milkweeds and he said no. I don’t think he wants to deal with something that he considers a weed. What might be some other options? We do have a patch of native prairie on our school playground. Should I add something to that which would look like the native prairie already there? Should I start some containers of a particular type of flowers indoors? We planted tropical milkweed at my school, here in Louisiana. It has beautiful blooms and we had several monarchs visit it and lay eggs. We have around 150 caterpillars in our elementary classrooms. The students are learning so much from this experience. It’s not invasive and will die down with our first freeze. I would speak with the principal of the school to inform them of the educational benefit of planting it. I wonder at how a custodian is allowed to make that decision. Zone 6, Louisville KY. I have honeyvine MW. It’s a pain but I’ve got a trick- cut/tear it all back after the spring eggs are hatched. Keep it cut back until August, then let it go. After this it’s easy to control and gets big enough for the fall monarchs to lay lots of eggs and there’s plenty of food for the cats. This also keeps my MW pretty much aphid free. The lack of aphids means less predators. Oh one more thing, plant sedums. The kind with giant pink fall blooms. Bees and butterflies go absolutely nuts over mine, there will be so many on each flower its astonishing to see. They’re not lacking nectar sources either, my neighbors and I organically garden, and we both have multiple planting areas. They just love it. They’re also handy if you have adult butterflies to feed indoors. Just pop one of those blossoms in the cage. Soak it in water for a few mins first to get rid of predators. Love this site! My daughter helped plant a pollinator garden at her old elementary school (it was a project for her Middle school science class). Our district has a “policy” (although it seems to be loose) about not planting things that attract bees because of student allergies/safety, etc. BUT, we have had great luck with bushy asters–they are beautiful right now, and have a ton of butterflies on them. I also snuck in several milkweed (mainly tuberosa), and because we disturbed the soil, we had honeyvine pop up all over. Also try blanket flowers and rudebeckia. I have MW seeds I bought too late to plant this summer. Do I plant them now and let the plants freeze this winter? Or do I plant them later this fall and let the seeds wait for a spring growth? How late will work? Most botanists and nurseries recommend moist stratification or “freeze-thaw” cycle and mechanical scarification for improved germination. I tried it and it made a huge boost for my common milk weed. For best results shake the seeds with some coarse sand in a bottle for 10-20 minutes (to open the seed case) and sow in the fall and let nature do the rest of the work for you. After you scarify, you can place the seeds on some damp (not wet!) papertowels in plastic baggies and keep then in the fridge over winter usually 4 months is good. Then sow in spring. Oh well 😋 Good to keep the info circulating right? Please add New England Aster and Stonecrop Sedum for good fall nectar sources. thanks for the suggestions Hannah, we are fall planting some sedum this season. As the season is winding down, I also wanted to thank you for being a great resource and inspiration. October has been warm and beautiful in Iowa, and I have been enjoying gardening and preparing for next season. My raising Monarchs report is not ready as I still have one chrysalis hanging and so many of them has turned to mush that I don’t know how it will turn up (53 healthy releases this summer so far, not all migrators, of course). I am doing some winter sowing for poke milkweed and spider milkweed, which I tried to start last fall but I think I failed, I never saw it coming up. I will also sow nectar seeds this fall, New England Asters, some other Asters I collected seeds for and I will go pick up some common mw seeds as soon as I have time from other tasks. I have many small seedlings of common mw from last fall’s sowing so I will have even more milkweed next summer. I will try to remember to cut some milkweeds down during the summer to promote healthier growth, but it’s hard if you have eggs and cats on them all the time. I have collected tropical mw seeds and I will grow them again indoors, starting in early spring, they were good size all summer and have bloomed well, some twice after cutting. the ones I overwintered were straggly so I have tossed those out. I have been transferring some cat mint volunteers to a hill that have lots of space and need cover. I realized that one great butterfly magnet, Giant Yellow Hyssop grew to 6′ and needs to have a better support or to relocate, but I think I will just try to cut it in early spring and just sow more seeds into a location where it has more room to grow and fall down. It was a great nectar source and always full of brownish little butterflies and bees. I also had whorled mw come up from seeds this summer, and it was kind of funny because I forgot that I had sowed them and I almost weeded them out. But then I remembered my mantra to investigate first, before pulling anything out. Turned out to be wonderful surprise and I was watching the two seed pods that came up and I sowed all seeds already. I have also improved my labeling method and bought weather proof sharpies for marking my plants. I have already started buying seeds again but also collecting what I can from my gardens, while leaving most for the birds. Hi Tony, thank you for this highly informative site! Am I understanding this post correctly that fall planting of SEEDS is not recommended? I have swamp milkweed seeds that I meant to plant in the spring, but I did not cold stratify, so I postponed. If I don’t get the seeds in this fall, do you suppose they’ll be worth a try next spring? Thanks for the quick reply and pointing me to the right page! I’m relieved to know I didn’t miss my window. I will do this in November as your post recommends. I appreciate your site! Success year #1 for me. Milk weed, check. Five butterflies released, check. 2 died. Plans for next year in place. Happy! I need some advice. I would like to use butterfly attractor plants as centerpieces for an event I am having the third week of October. The idea is to give them to guests to take home for fall planting but it would be great if they also look nice. Any suggestions? Hi Jennifer, you don’t say where you’re located but asters are a late blooming perennial, and there are dwarf varieties that would look probably make a good centerpiece. If you are in a warmer region lantana flowers are nice too. In colder regions, they can be overwintered indoors. Thank you for the wonderful information. But I have noticed it is for Northerns and I live in Texas, San Antonio. So the growing season is longer and I am still seeing Monarchs in my yard. I do have milkweed growning in different areas in our 1/2 acre property. Could you sometimes address some of the issues for our area? Those little yellow aphids are a problem right now. I live in San Diego County. This was my first year of raising. My community garden club had 10 members growing milkweed this year but I was the only one who raised my monarchs in a cage. I have planted tropical milkweed seeds in my greenhouse (85 plants) to distribute to the entire garden club in the spring, hoping to have full sized plants for them. I also ordered a pound of California native milkweed seeds (A. fascicularis) which I will also pot up and distribute. I built a screened butterfly cage (60″x42″x36″) that can be lowered over six 5-gallon nursery pots that hold full-sized milkweed plants (18 plants total), as soon as eggs are present. It has an openable top for releasing the butterfly when they are ready to fly. The plants are on a drip irrigation timer, so there’s no need to disturb anything until after all the eclosing has occurred. Then I can remove the cage, clean it, prune back the milkweed and swap it out with full grown plants to start the process over again. It worked really well my last raising, earlier this month. I am encouraging others in my club to try it. It allows a more natural habitat (no disturbances for cats or crysali) but with protection from the flies and wasps. This was my first year for raising Monarch Butterflies. I had a great time. I released 55 butterflies so far. I also have released a few Queen butterflies too. It has really been rewarding. I will continue again next year . I planted mixed northern seeds this year, they have no flowered, so I don’t know the plant type. They are much sturdier than the tropical. What do I do with these this winter? Cut them back or leave the stalks for new growth next year? Thanks Judy, I do have this listed on my milkweed resources page. for most of us across North America this would be an annual and would need to be overwintered indoors. I am overwintering Calotropis procera, which is both host and nectar plant for monarchs. Check out this site http://davesgarden.com/guides/pf/go/67012/ I found this plant at Home Depot in the Spring of 2013 & it has done well here in zone 9a of Central FL. I don’t find as many caterpillars on it as I do on tropical milkweed, but it’s leaves are excellent for feeding them in the cage. I put the stems with leaves in water & they don’t wilt & are much bigger than the tropical milkweed. The caterpillars devour them. Makes a good combination of plants for raising monarchs. I too am thinking about planting some sweet Joe pye weed this fall. I have seen them in the wild and the Monarch’s and other pollinators enjoy it. I have heard they will bloom first year from seed? Even if they do will they produce nectar? Often times it seems plants as though plants may bloom first year but attract far more pollinators years 2+. Maybe it just takes pollinators time to find them etc…I’m interested in knowing what you think. Hi Chris, based on what I’ve seen, I think you might be right about second year plants attracting more pollinators. I have a sterile butterfly bush that I was going to replace this season because it didn’t attract any pollinators in year one. This season, there were monarchs draped all over it. I’m glad I didn’t make a rash decision. I usually test out plants for a couple seasons anyway because so many factors can affect their success in the garden. You may be on to something about lower nectar production in year one…I also think smaller plants attract less butterflies. Good luck with Sweet Joe Pye! I’m a newbie monarch mama and moved from Santa Barbara to Santa Cruz. My old SB location is thriving, but I haven’t seen any here. Any advice? Hi Aja, sometimes it takes them a while to find your new location. All I can suggest is that you create/improve your new garden so that when they do find it, they keep coming back. Here is a post that might give you some ideas for your new garden…good luck! Tony – thanks for the wonderful information. Most people think of planting in the spring for flower blooms, but what a great tip to encourage folks to plant for the fall. I have placed an order for all the plants listed. We are waging the valiant fight to save the Monarchs in North Carolina. Hi Marilyn, I’m happy to hear you are taking the fall planting plunge for your butterfly garden and the east coast monarchs…I look forward to hearing about your plants next season! I went hiking around the public fields that were abundent with many wildflowers, including milkweed, and have jars of seeds read to go. This week I am starting to seed the sunny spot in my yard which will hopefully be for butterflies. I am using my own mulch compost for the cover. Meanwhile, in another very lovely garden where roses and evergreens live, I have lectured my several praying manthis who always come to help and enjoy the spraying water. This year when I bend down to greet them and look at those lovely green eyes, tell them how beautiful they are, I worry about next year. Their babies will be so small I won’t see them but in late summer they will be the hunters in my garden. I can only hope by late summer the butterflies will be leaving for their migration. Hi Barb, lots of pollinators and birds like spraying water too…I sprayed countless monarchs and swallowtails this season. I hope your mantises find other food sources! I have been raising monarchs for years on common and swamp milkweed. I live in Wisconsin and have a greenhouse. I would like to start a milkweed garden of various species. 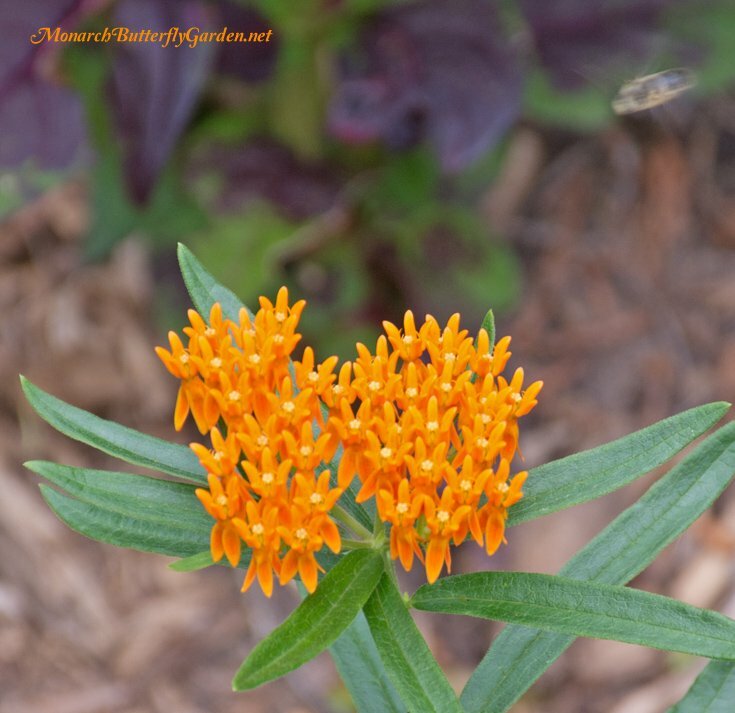 I do have an orange “butterfly weed” which has not been a popular host for the eggs. Can I buy the curassavica in a month or so, after we return from vacation, keep it potted and growing inside over winter and take cuttings of it in early spring to root and plant outside? Any chance they would survive the winter here if protected? Just wanted to take a moment to thank you for your website and all you do. You are the best!